Must Read. A novel and an Education. A story, to my mind, succeeds if it breathes, lives like real organism. Then and only then will it grow inside you, around you and about you, and merge your reality in its fantasy. This in simplistic terms mean that it will hold your finger, sweet-talk and take you along to the point where the real melts into imaginary, with such sudden slyness that a reader can hardly distinguish which is which. It is this fantastical writing which emerges from a real environment which makes classics utterly readable. The ephemeral envelops the eternal in these works of art. These stories do not float in air, they are the products of their times, and their roots are planted firmly on the hard soils of the time, the epoch whose story they tell. They are neither historical recordings nor the even claim to be that. Stendhal writes- I make no claim to the veracity except in matters that touched my feelings. It matters not that this masterpiece rose out of a news clipping regarding a sensational murder. Stendhal tells us a story, a gripping story. The characters of this story are real, and like real people are the products of their times. Most modern writings unfortunately short-changes us on that. The novels which attain immortality carefully and delicately tell us about the world in which those stories came to life. So Middlemarch takes us to an old British countryside, Heart of Darkness takes us to an African Colony and Love in the Times of Cholera takes shape in a fictitious Latin American country. These writers take time to describe the social and political realities of their times, before they internalize the story which germinates largely into the minds of the protagonists. It is a very delicate task to shift the vantage points between a wide external reality and the intimate internal psychology. The writer never lets the story stand on the staid neutral ground of nearness to a character, it oscillates between the two worlds- the inner recesses of human mind and the wide universe viewed from the top, the socio-political vantage point. It grows in the mind of the characters, much like Dostoevsky and when at times the author steps out of the mind of his character, he jumps and stands a a high vantage point from where he observes the world in which the character exists. This difficult but brilliant technique makes the character not only believable, it also makes them forgivable. Stendhal whose initial education took place under Ideologues, a group of 18th century investigators of psychology, puts his understanding of psychology to a great use as he creates the landscape of the minds of character on which the great story plays. As I writer, in this regard I find Stendhal much closer to the great Russian, Dostoevsky than any of his contemporary European writers. This style, this realism, about the impact of society on human mind and impact of human mind on its relation with the world around him (or her), makes it also easier for the writer to establish the characters, with honesty, without the fear of a reader rejecting the character. As is the wont of any novel with serious psychological treatment blended into it, one doesn't find any of the character evil, whether it be always scheming mind of desperate social-climber Julien Sorel, or the Adulteress Mme. De Renal, the wife of his employer, a minor officer in a minor village in France. The extremely status conscious, and somewhat snobbish Marquis De La Mole in Paris who offers Julien his second lease of employment and uses plebeian Julien for amusement and later, exploits Julien's exception memory to use him as a tool of political conspiracy also comes out as a very human character, stuck in the compulsions of his own circumstances. You are almost sympathetic to every character of the story, and one embraces the ever scheming Julien with open arms, his very human flaws, notwithstanding. This is the magic of a story that plays well in the mind of a character. Napoleon, post his defeat, left a legend and dashed dreams of liberation from social hierarchies particularly for those who came from lower strata of the French society, like our hero, the carpenter's son. Napoleon, who from a humble beginning made it to the highest place in the French polity made it possible for people to believe in their dreams, even after his failure. He was a self-made man, who stood not only to the erstwhile French social order, but also to the church. 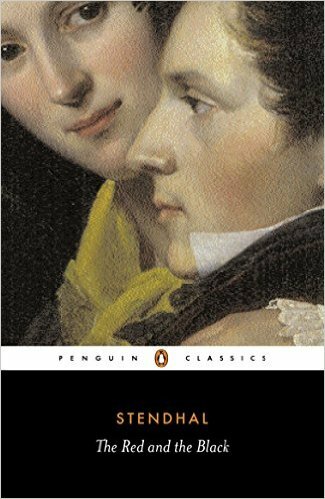 It is absolutely to the credit of Stendhal to have written a novel which not only takes a very critical view of the church, to further complicate matters for himself, also in the person of Julien, celebrates his failed hero, Napoleon. He subtly brings forth the Nihilist idea when he, with great truthfulness writes- "A revolution cancels all the capricious society's titles and distinctions. In a revolution, a man assumes whatever rank he earns by his behavior in the face of death." No wonder that Nietzsche called him France's last great psychologist. That is to the credit of his mastery over his cunning craft that with all the politics contained in the story, he refuses to let the novel become a political tome. He writes, as a kind a confession, or probably as a tool to remind himself, in the novel- "Politics in a literary work is like a gun shot in the middle of a concert; something vulgar and however, something which is impossible to ignore." So the undercurrents of politics- a neglected aristocracy, a powerless plebeian society deprived of any say in the social power structure, a Church struggling to regain its lost foothold, an aristocracy desperately fighting for relevance and to regain lost legitimacy- It is the story of a society in a flux. I correct myself- It is a story about people in the middle of a society in flux. It is therefore not a social commentary, it a story of a small-town officer, his wife, bored and looking for a fling, but unable to bear the guilt of adultery, Julien, the hero, a social pariah with exceptional intelligence and romantic bend of mind, looking for affirmation of his place in the world through his wins in terms of female affection, Abbe Pirard, the religious figure, who briefly becomes Julien's mentor, and Marquis De La Mole and his family, aristocrat, and Mathilda, Marquis's daughter, falls in love with Julien, captivated more by her own ideas of love than by the charms of Julien. These are all the character floating about in a very fluid time, searching for their own pieces of firm ground to settle upon. The story ends with Julien being sentenced to death- strangely, a death he happily walks towards, with a definite sense of achievement. One is left with a bitter-sweet taste of loss and win, both as undefined and as incomplete as the other, in the end. The Red in the story stands for the state and the Black for the church, the two axis which held men in their place in those days of 18th century, and with the two axis themselves unhinged from their sure stations, it left men who referenced their lives to them, floating and struggling with their own very human desires and ambitions. In the immediate aftermath of the demise of the greatness, all that is left in the society is a bitterness of mediocrity, all ideals lie decaying in the dust and the individuals are gasping for an opportunity to restore their faith in the greatness of human spirit. The writer, an admirer of Napoleon (Stendhal was a part of Napoleon army when he crossed to Italy (the Rise) and when he went on his ill-fated Russian campaign (the Fall)), comes out waving a definite flag of admiration, in the person of Julien Sorel, when the Napoleon had already fallen and critically looking at the mechanization of the Church, when it was regaining its lost station in the scheme of things; at the end of the story, looking the times he lived in, Stendhal is the biggest hero of this story. This novel is at least as brave as Crime and Punishment, if not more. His earlier book, On Love, published in 1822 sold 17 copies (worse than Schopenhauer who sold 32 copies of his first book), his second, Armance, published in 1827 also failed spectacularly right after he was charged with spying and asked to leave Italy. To write a brave book after this, in 1830, stands an testimony of what literary courage is all about, for writers even today to get inspired about. It is an example of how to be true to your ideas, your convictions without becoming a propagandist or and dutifully staying away from misusing the pulpit of an author. He tells the story, narrates the back story of the time when it happened, the mind which made it happen and then he stops. He does not tell you what to think. He leaves his characters without being judging them for the reader. He wrote once- "A novel is like a bow, and the violin that produces the sound is reader's soul." He is one great writer who respects his reader and it comes out in his writing. This is a story well told, this is a story told very lovingly. This is a reader's delight (if you have the patience to sail through French names and long narrative) and it is definitive part of a writer's education. Do read. This novel is a lesson in writing and it is a lesson in living.